You wake up and get anxious. There are emails you have to reply to. You get going and a sense of duty to your job sweeps over you, and carries you forward with the to-do list. You know that mediation can bring you back to a place where you’re more effective, you’re just pulled in so many directions. yet you feel like you should have done it today. If applied properly, practicing meditation can enhance your concentration and your ability to notice opportunities around you at any given time. It can help you feel more stable and can lead to you actually being happier and healthier overall. The days of forcing yourself to be mindful and then looking at your phone and getting distracted are over. Now your phone is on your side. Because you can use your phone to practice meditation and relieve stress. As the original content creator for Aura, I’ve built up a massive library of free 3 min meditations in my channel, Mindful Moments and 91k+ subscribers. Access to a teacher, and guide while you begin to explore meditation is NECESSARY. But you’re busy, and let’s be honest, consistency is not your forte. THE SIMPLE WAY: I’ll email you a free meditation every week. Listen right away and BOOM, done. In time, you’ll pick up skills and mindsets that really help. Yoga Therapy is the adaptation and application of yoga techniques and practices to help an individual, facing health challenges at any level, manage the condition, reduce symptoms, restore balance, increase vitality and improve attitude. Medical research shows that Yoga Therapy is among the most effective complementary therapies for common complaints: from neck and low back pain to a high-stress lifestyle. Practices are expertly used for specific needs of each student in our small group. We'll address health challenges in a way that doesn't usually happen in a class. Because of that you’ll learn specific movements that will help you feel great! This iconic building used to be the Plant Recording Studio where Fleetwood Mac recorded Landslide. 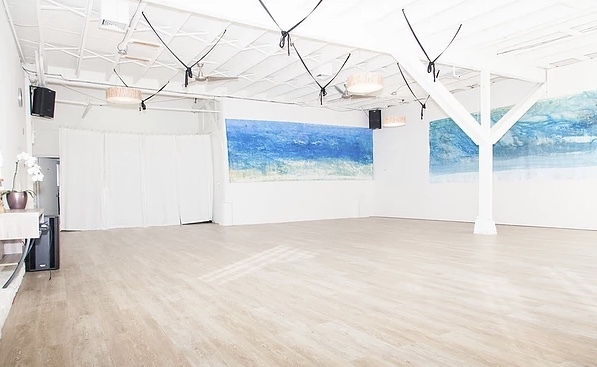 It’s now an oasis for yoga + meditation equipped with an infrared + cedar hot sauna, garden havens, a tea lounge, community work space, local art and light-filled, spacious rooms. Come share a cup of tea and conversation after my spinal release yoga therapy class! The simple, yet profound postures directly decompress the five segments of your vertebral column: tailbone, sacrum, psoas, rib cage and cervical. As you release spinal tension, you settle your mind, and problematic mental and emotional patterns mapped in the subtle body begin to resolve. Individual attention, meticulous alignment, hands-on adjustments, and supportive props ensure that the process is effective and personalized. The space is held in a nurturing, grounded way — with an emphasis on undoing, turning within and letting go. This is deeply healing and will make your meditation practice much more blissful and enjoyable. For the past two years I have lived with chronic pain brought on by daily migraines. Conventional western medicine has not worked. I decided try alternative forms of healing. I received a referral to Lauren and took her class. Once in her class I experienced the calm, healing affect she has and knew this was for me. Lauren is passionate, caring and thoughtful. A true healer and yogi. Her wisdom shines through as she listens, thinks and adjusts the work to meet my needs. The addition of meditation to the yoga therapy has been a bonus and has deepened my healing. After working with Lauren my migraines have been reduced in frequency and intensity. For the first time in two years I no longer take medication on a daily or even weekly basis. I feel like I have been given a new lease on life. I had taken a couple of Lauren’s group classes in yoga therapy and was instantly aware of how the subtle positioning and movements helped my lower back and hips feel so much better. I started to have some chronic pain in my leg, almost a sciatica feeling, and it became clear that yoga and massage were just not enough to keep it from creeping back. I started to see Lauren privately and she was very thorough on her intake questions and seemed to know exactly what the problem was. After the very first session I felt as though my body had been ever so gently realigned and it was quite honestly life changing for me not to feel that tearing sensation in my leg . The sessions are really so relaxing, almost like a cozy nap, and Lauren’s guidance with her calm and nurturing voice make the experience wonderful. In the past, I was in lots of pain that I’d try to push through just to get everything done. Since learning to meditate with Lauren, I have a place to heal,, so instead of (unsuccessfully) pushing through the pain, now I’ll stop and sit still. I’ve done yoga all over the world, literally, and had the pleasure of being taught by Lauren in Cambodia. I was super impressed with her classes and her approach - she not only made us feel very special and loved, but rejuvenated. I recommend this wonderful, caring, spiritual and very dedicated individual. She will help you no matter what your particular journey. Lauren is a true gem! She is a wealth of knowledge and her passion shines through. I send anyone dealing with pain, trauma or high amounts of anxiety to Lauren. I used to struggle with a pain deep in my hip. With a very simple but powerful technique, Lauren facilitated a full release of tension. She also lead a retreat on my property and offered simple ways for every kind of person to access tension relief. Her own meditation experience is evident in the wisdom of her words as she guides meditators on an inward journey. Now I don’t have to wait another 10 years to be happy! I’m more confident than ever that I’m on the right path since working with Lauren. I feel undefined by my past. Lauren has a beautiful, calming aura about her that instantly makes you feel calm and grounded. She has dedicated her life to the studies of the healing arts - psychology, ancient eastern philosophy, yoga therapy, and meditation - and her dedication and passion show through her work. She is a superb listener, and sometimes that’s a powerful tool for healing. When I tell her about my pains and issues, she holds the space with compassion and without judgement. She asks well thought-out questions to help us figure out root causes of my aches and pains. Her adjustments in yoga therapy are gentle but grounding - great for those in pain. She always finishes in a sweet guided relaxation that just takes me out to the zone! Lauren is honest, compassionate, empathetic, supportive and loving. In her presence, I want to up, understand and grow. GOT FEEDBACK OR A BURNING QUESTION? LET’S HEAR IT!